SharePoint 2016 introduces a new feature to automatically create indexes on list fields, Where the list has more items than half of the list threshold value. E.g. If the list threshold is set to 5000 items, and your list has a view with more than 2500 items in it, then the automatic indexing process starts automatically by a daily timer job "Large list column index management Timer Job". 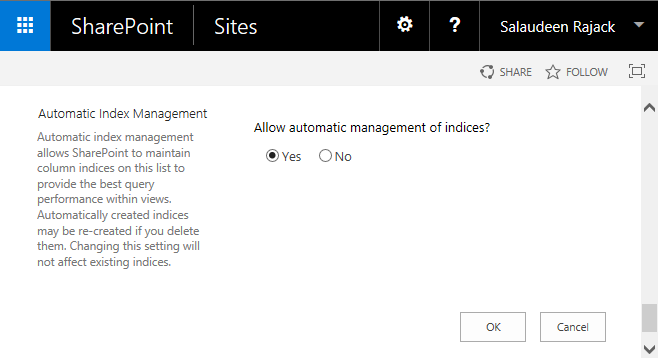 How to Enable Automatic Index on SharePoint List? This behavior is controlled from Advanced Settings page of the list. If you head on to List Settings >> Advanced settings >> under "Automatic Index Management" section, you'll find an option to turn ON or OFF Automatic Index Management option. By default for all list and library the property is enabled. This setting determines whether this list should automatically start indexing its fields when its item count reaches half of the threshold. Using PowerShell, you can turn this setting on or off by changing the EnableManagedIndexes property on a list. Similarly, You can disable automatic indexing by setting EnableManagedIndexes flag to $False. Approval Workflow Missing in SharePoint 2013? How to Get SharePoint Farm ID using PowerShell?